A leaked report from the Attorney General’s Department on the case against Avant Garde Maritime Services, confirms the Colombo Telegraph report which exposed the Attorney General’s recommendations on the possible arrest of Gotabaya Rajapaksa. 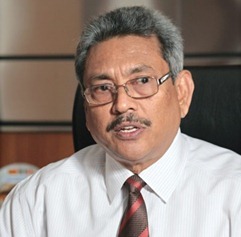 According the report AG did recommend that the former Secretary to Ministry of Defence Gotabaya Rajapaksa and four others would be arrested for committing offences pertaining to the Unauthorized Importation of Fire Arms to Sri Lanka (Under the Prevention of Terrorism Act and Fire Arms Ordinance), Possession of Fire Arms and Ammunition Without Valid Licenses (Under the Fire Arms Ordinance and Explosives Ordinance) and aonspiracy, aiding and abetting to commit the above offences. As Colombo Telegraph exclusively reported on March 09, 2015 it was Prime Minister Ranil Wickremesinghe who prevented the arrest of Gotabaya Rajapaksa. The Attorney General’s Department consulted Prime Minister Wickremesinghe over the recommendation that Gotabaya be taken into custody together with four others for alleged violation of the Firearms Ordinance and other laws. Prime Minister Wickremesinghe has said that the former Defence Secretary should not be taken into custody. 3. Conspiracy, aiding and abetting to commit the above offences. An investigation by the CID is ongoing in relation to the authority given to the Rakna Lanka Company and Avant Guarde Maritime Services to supply weapons and other related services to the merchant ships and fishing trawlers using weapons belonging to the state and others. This report pertains to the case of the Floating Armory run by the and Avant Guarde Maritime Services. A consignment of military weapons and ammunitions was found without lawful authority in the possession of Avant Garde Mritime Services in a ship by the name of ‘Mahanuwara’ docked at Galle harbor. At the time of the commencement of the investigations ship had contained more than 3000 guns (including AK 47 rifles and other military weapons) and ammunition amounting to more than 7 hundred thousand rounds. The ship is leased out to Avant Guarde Meritime services by its lawful owners ‘Lanka Shipping’ and the said firearms and ammunitions were found in the exclusive possession, custody and control of the Avant Garde Mritime Services. At the moment, on our instructions the CID and the Government Analyst’s department are in the process of taking a stock and carrying out necessary tests of the said firearms. A summary of a proposal (dated 18th August) submitted by the chairman of the Avant Guarde Maritime Services, to position a Floating Armory in OPL Galle had been submitted by Ms Jayaratne for the authorization to the then Secretary to the Ministry of Defence Gotabaya Rajapakse . Secretary has authorized the said proposal by placing his signature on the same, which is annexed herewith marked X1. By her letter dated 18th September 2012 Ms. Jayaratne Additional Secretary to the Ministry of Defence had granted approval for M/S Avant Garde Mritime Services to deploy a Floating Armory off Sri Lanka in the International Waters. (Annexure X2). This happens to be the only authority that has been granted to Avant Guarde Maritime Services to hold the possession of the said numbers of weapons and ammunitions. CID investigations have revealed that the ship (or the vessel) in question had been doing all her operations completely being docked at the Galle harbour and had never carried out any of its business transactions being deployed in the international waters, as per the authority granted. They had supplied arms and ammunition to the merchant ships to get protection against sea pirates, a transaction previously handled by the Sri Lankan navy. The whole process seems to have been done with the ulterior motive of handing over a massively profitable business previously done by the Sri Lankan Navy to the private company by the name of Avant Garde Mritime Servises without, adhering to any transparent tender or other procedures. The CID investigations have revealed that the Avant Garde Maritime Services earns a daily income of nearly Rs.15 million from this business transaction. 2. Possession of Fire Arms and ammunition without valid licenses. Unlawful importation of firearms into Sri Lanka under the Firearms Ordinance. According to Sec 3 of the Firearms Ordinance the importation and possession of guns in Sri Lanka “shall take place only in accordance with licenses and permits provided for by the Fire Arms Ordinance. According to Sec 9 thereof,the importation of guns into Sri Lanka is prohibited except (a) through any approved port of entry in Sri Lanka or by passengers arriving at any approved port of entry. In terms of Sec. 9(2) any person importing a gun into Sri Lanka otherwise than in accordance with this section shall be guilty of an offence. No license or a permit has been issued to the Avant Guarde Maritime Services under the Firearms Ordinance to import gums. When the service was handed over to the Avant Guarde Maritime Services from the Sri Lanka navy only 800 odd guns had been handed over. Presently there are more than 3000 military fire arms in their possession. for conspiracy and aiding abetting the above mention accused to commit the said offence. Moreover, the preamble to the Prevention of Terrorism Act states, that it is also an “act to make the prevention of unlawful activities of any individual group of individuals within Sri Lanka or outside Sri Lanka”. According to Section (1) E, of the Prevention of Terrorism Act, “Any person who without lawful authority imports any firearms or ammunition shall be guilty of an offence”. According to Section 3 (b) thereof any person who abets, conspires, attempts, the commission of an offence; liable to imprisonment for a period not less than five years not exceeding 20 years. The offence of unlawful importation of Fire Arms by the Avant Guarde Maritime Services, falls into the ambit of the said offence of the Prevention of Terrorism Act. According to Section 22 (1) of the Firearms Ordinance, “No person shall have in his custody, or possess or use, any gun, unless he shall hold a licence therefor in accordance with this Ordinance”. (b) The number and description of the gun for which the licence is desired ; and shall, if required, produce such gun before the licensing authority for inspection”. The Avant Guarde Maritime Services had not complied with the above provision. No person, other than a licensee or permittee who is authorized by his licence or permit to do so, shall import any explosive. In terms of section 9(2) No person shall except under the authority of licence import, possess or use any explosives for any purpose…. Section 3. (1) of the ‘Money Laundering Act’ is to the effect that any person, who (a) engages directly or indirectly in any transaction in relation to any property which is derived or realised, directly or indirectly, from any unlawful activity, shall be guilty of the offence of money laundering. The act defines “unlawful activity” as meaning any act which constitutes an offence under — (b) any law or regulation for the time being in force relating to the prevention and suppression of terrorism; (d) the Firearms Ordinance (Chapter 182), the Explosives or the Offensive Weapons Act, No. 18 of 1966. I am of the view that a strong prima facie case has been established against the said five suspects, and that they should be indicted under the above discussed provisions of law. It is further recommended to seek an order to cease all the illegal business operations of the Avant Guarde Maritime Services relating to the floating armory forthwith, and hand over the weapons and ammunitions stored therein, and in their possession to the Sri Lankan navy directing them to continue with the business of supplying arms and ammunitions to the merchant vessels. Guard Big Shot Nissanka Senardipathy. But……… this operation cost nothing to the GOSL. it created employment and foreign exchange. Its a business where Navy as a service arm of the GOSL could not handle. As for financial crime, no GOSL funds involved. This was an offshore operation which are exempted from import restrictions? If the above report is the truth, we would like to know why the Hon PM has done so.Also like to hear from him the reasons for such prevention.